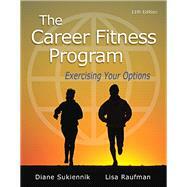 This book is designed to help learners choose, change, or confirm career choices. The Career Fitness Program is firmly focused on today's career realities and economy–with sufficient breadth to encourage change and growth for learners of all ages, backgrounds, and circumstances. User-friendly, easy to read, and appropriate for all learners, it provides three teaching and learning career handles-choice, change, and confirmation-that help students find their career ‘fit’. For career choice, the book follows the standard sequence of career search and decision-making issues–Personal Assessment, World of Work, and Job Search. For career change, it offers critical questions thatgo beyond facts and figures to help learners focus on “What’s in it for me?” especially when changing careers. For career confirmation, it provides direction, understanding, and reassurance, showing learners how skills acquired in college are transferable to the world of work. This title is also available with MyStudentSuccessLab—an online homework, tutorial, and assessment program designed to work with this text to engage students and improve results. Within its structured environment, students practice what they learn, test their understanding, and pursue a plan that helps them better absorb course material and understand difficult concepts. Dr. Diane Sukiennik is a career counselor; a licensed marriage and family therapist; and an internationally recognized lecturer and workshop facilitator. She holds an advanced degree from Columbia University and has extensive postgraduate training in industrial psychology, management, and organizational development. Dr. Sukiennik was on the faculty of Moorpark College in California. Her areas of expertise are career development, personal and professional presentational skills, and managerial effectiveness. She is a consultant, has a private practice, has contributed to the development of a nationally distributed telecourse on career and life development called "Career Advantage" distributed by PBS, and she is an executive career coach. She walks her talk by turning a lifelong passion into a popular website, www.foodandwineaccess.com.